Home Ferrets Can Ferrets Eat Chocolate? Welcome to our complete guide to ferrets and chocolate. Can ferrets eat chocolate? What should you do if your ferret sneaks a piece? Let’s find out! If you are like most people, you probably see no reason to argue with the statement that chocolate is delicious. After all, chocolate is delicious…..to us. But while we humans love chocolate so much we celebrate its discovery with an annual holiday (July 7 each year, in case you’re interested), ferrets and chocolate absolutely do not mix. In short, chocolate is not safe for ferrets, and it is important to know this and take every precaution to keep your precious little fur love far away from chocolate. 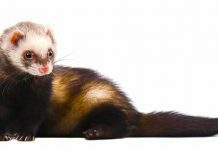 In this article, we will answer in detail the question “can ferrets eat chocolate?” and look at what to do if you discover your pet ferret ate chocolate. Believe it or not, the first aspiring ancient Aztec chocolatiers were not trying to make Hershey kisses from those little cacao beans. They were actually attempting to use the beans to make beer! Luckily, those aspiring beer-meisters failed mightily. Instead they used the resulting bitter brew, called xocoatl (“bitter water” – yum!) as a medicinal drink to stimulate fertility and bless marriages. They also invented a chocolate god and made a temple for him. With the passage of time and the spread of cacao use to other regions and cultures, cacao pods became so coveted and valuable they were used as currency to buy everything from tamales to livestock. This went on until enterprising farmers figured out how to mass-propagate the cacao tree and harvest the beans on a much greater scale. In the meantime, folks with funds were busy drinking, and later eating, this potent treat. But what exactly does chocolate have in it that made it pretty much an instant hit with people? Sure, it tastes great, but that can’t be all there is to the story…. According to the World of Chemicals, chocolate contains at least 300 known chemicals. Some of which are quite literally body and brain-altering. While these chemicals may not add up to any kind of significant impact for you when you consume chocolate, in your tiny pet ferret chocolate consumption can quickly become very toxic and even deadly. Can ferrets eat chocolate? No! According to human health experts, a “healthy daily dose” of chocolate – and ideally this would come from eating dark chocolate – for the average person is 1.6 ounces, or about one-quarter cup, 50 grams, or one-tenth of a pound. Now let’s take a look at the average general weight of an adult ferret. A jill, an adult lady ferret, generally weighs between one-half and one kg (one to 2.5 pounds). A hob, an adult male ferret, will tend to weigh anywhere from one to two kg (two to five pounds). So imagine what can happen when a ferret weighing around two pounds eats as little as a single serving of 1.6 ounces of chocolate, or about one-tenth of a pound. This is a chocolate ferret health catastrophe you definitely want to avoid! Is chocolate safe for ferrets? Some teacup dog breeds weigh in at around the same range as the average adult ferret. So while comparing the two species side by side won’t ever be an exact match in terms of symptoms, treatment or health outcomes, this handy chocolate toxicity meter for dogs still offers a helpful guide to illustrate how dangerous chocolate consumption can be for ferrets. We hope you NEVER ever have to use this chocolate toxicity meter for any of your pets. But do take a moment now to secure your chocolate stash well out of your ferret’s reach just in case. But what if you aren’t sure if your ferret ate chocolate? What specific danger signs are you looking for? For example, what if your ferret gets into some chocolate somehow – maybe when a friend brings it into your house in a bag or purse, for instance – and you don’t realize it, but your ferret starts behaving strangely? How can you know what might have caused this altered behavior? So far, none of this is good – in fact, it is super bad and scary! Here, however, it is important to remember that we picked the WORST kind of chocolate for a pet ferret (or any pet) to ingest, which is dark chocolate. Dark chocolate is the most dangerous kind of chocolate because it has the highest levels of the toxic compounds we talked about in the earlier section here on chemical composition of chocolate. This change in risk and symptoms, which is based both on the weight of your ferret and the type of chocolate consumed, also clarifies that it is very important to try to find out what kind of chocolate your ferret ate. For example, milk chocolate carries a lower risk than dark chocolate, and white chocolate generally carries no risk at all since it lacks the cacao ingredient entirely. My ferret ate chocolate – what should I do? 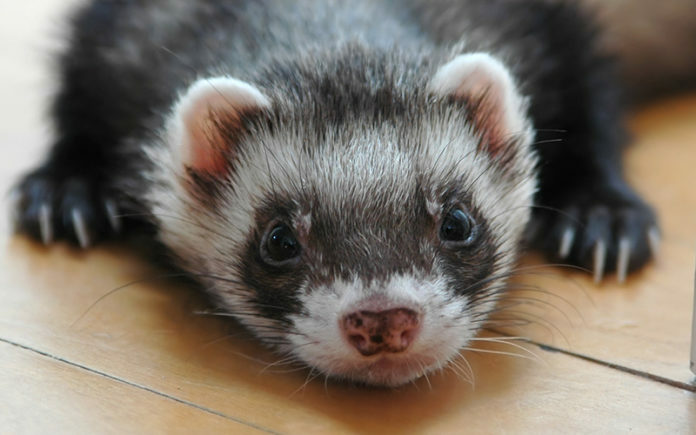 Because of the average ferret’s low body weight and chocolate’s known toxicity, any instance where your pet ferret consumes chocolate should immediately be followed up by a trip to the veterinarian. If your regular veterinarian is not available, seek care at the nearest animal emergency room. When you and your ferret arrive, it is quite likely that the first step the vet will take will be to try to move the ingested chocolate out of your ferret’s system as quickly as possible. Here, it is important to remember that ferrets, unlike many pet mammals, are not considered “opportunistic feeders.” This means that they do not eat more at any one meal than they need to function energy-wise for just the next few hours. In other words, anything your ferret just now ate will be burned up and excreted within three to four hours at most. This is particularly significant when it comes to ferret chocolate consumption because the treatment time window between when your ferret ate chocolate and when the full symptoms and health effects may be seen is generally very short. 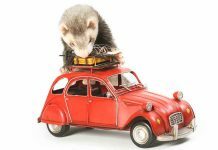 In summary, the more quickly you can get your ferret to a vet, the better for you both. Once at the vet clinic, there are a number of medical procedures that can be used to try to move the chocolate very quickly out of your ferret’s system, including emetics (induced vomiting) and enemas (induced defecation). 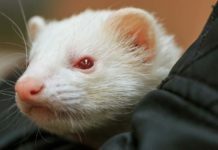 Both approaches are generally considered to be safe emergency medical procedures to use for ferrets when a toxic substance may have been ingested. If possible and only if it is handy, bring the wrapper of the chocolate with you to the animal ER appointment. But if you cannot immediately find the packaging, do not wait and look for it. Just take your ferret to the emergency vet ASAP for the best possible health outcome. Can ferrets have chocolate – no! 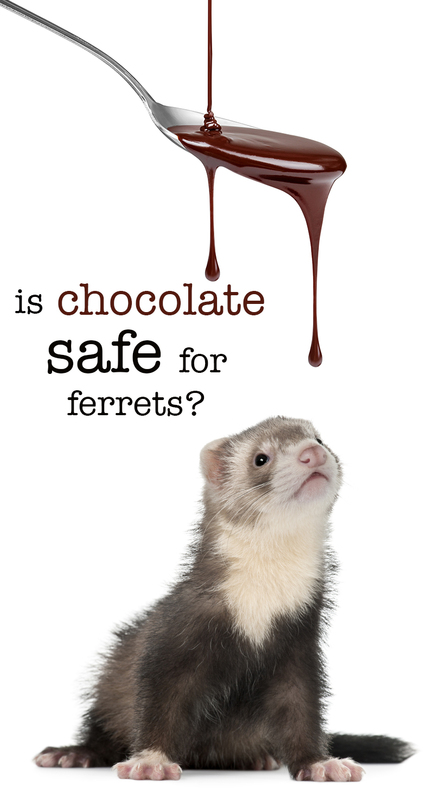 While there are many healthful treats that your pet ferret can safely enjoy, chocolate for sure isn’t one of them! Here, if you are reading this while stressing out that your ferret ate chocolate and what can you do and OMG will your ferret die, STOP stressing and just go to the animal emergency room right NOW. And remember as you are driving to the vet that there are MANY success stories where ferrets ate chocolate and still survived to live long and happy lives. The key is to take action and not wait. In conclusion, whether you know for sure or you simply suspect that your ferret has eaten chocolate (or any toxic substance), just go to the vet. Your wallet may not thank you but your ferret and your heart surely will! Hart, Hugh, “July 7, 1550: Europeans Discover Chocolate,” Wired, 2010. Padilla, A., “Liquid Gold: The History of Chocolate,” History Cooperative, 2007. DeNoon, D.J., “A Dark Chocolate A Day Keeps the Doctor Away,” WebMD, 2004. Hammett, D.E., et al, “Ferret Care,” Small Mammal Medley, 2012. DeClementi, C., VMD, DABT, DABVT, “Decontamination in toxicology cases (Proceedings),” DVM360, 2011. Previous articleHamster Sleep Guide – How Long Do Hamsters Sleep For?